Further details of known children of John MacDonald and Katherine MacDonald and their descendants. Further details of known children of John MacDonald and Katherine MacDonald with some information on their descendants. George MacDonald born about 1792. Robert MacDonald born on 22 Jun 1795. Isabella MacDonald born in 1797. Alexander MacDonald born in May 1801. Identified in a letter of 2nd May 1861from Robert MacDonald from Keils, by Port Askaig, Islay to his son Roderick. : - "Dear Roderick, to gratify your wish to know something about your ancestors, I copy the following from my family record, viz...............My eldest brother, George, was a soldier in the 42nd Regiment, & was wounded, & died thereby, at Bayonne, shortly before the battle of Waterloo". As Robert's eldest brother it would seem likely that he was born circa 1792. This would mean a likely enlistment date of circa 1810. It would seem likely that George received his fatal wounds at the Battle of Nive on 9th - 13th Dec 1813. The Nive was a river with 35,000 French defending it. Wellington had 14,000 British and Portuguese to attack their fortifications. The river had been crossed on the 9th and took up a strong position on the heights near St Pierre. The 1st battalion 42nd Black Watch were at Bayonne and were attacked on the 9th, 10th, 11th, 12th and 13th, in what was some of the most severe fighting of the war, but every attack was repulsed, the 2nd Div on the 13th were given the order "Dead or alive, my lads, we must hold our ground". The roads were said to have be literary running with blood. Over the five days the 2nd battalion 42nd Black Watch suffered only 28 casualties. With all the French attacked repulsed, the Allies advanced to occupy the position near Adour. The French lost about 10,000 men and the British casualties were 5,019 men, a sign of the fighting power of the soldiers when faced with over 2 to 1. The 1st battalion 42nd Black Watch received the Battle Honour and clasp "Nive" for their part in this battle. However on the 14th April 1814, after Napoleon's abdication there was a break out sortie by the French garrison at Bayonne which cost a number of British casualties. Which Regiment suffered the casualties I do not know? Investigation of the Black Watch Muster Rolls (initially for 1813) might provide more info on George. Born circa 1797. Isabella is mentioned in passing throughout Robert's letters but the first actual record I have of Isabella is in the 1841 census for Lower Achrimsdale, Clyne, (just down the coast from Loth). Alexander Cameron recorded in the Golspie parish record thus - "Cameron : Alexander, natural son of Alexander Cameron, saddler, Golspie, and Isabella MacDonald was born 27th May 1827." Donald Sutherland, recorded in the Clyne parish record thus : - "4th April 1834, William Sutherland and Isabella MacDonald at Achrimsdale - a son Donald." Donald's later death certificate records his father as a "schoolmaster". It would seem that not only Alexander but also Donald were "natural" sons as there is no record of Isabella ever marrying, no record of any husband or husbands, her later death certificate records her as "single" and her surname is consistently given as Macdonald . On wonders what brother Robert with his strict "Free Church" views made of this!! For the census of 1841 Isabella was living with her father John MacDonald in the family croft in Lower Achrimsdale (latterly known as Greenhill). Included in the household are her two sons Alexander Cameron and Donald Sutherland. 1841 Census (7th June) Clyne (45) Book 3. Page 12. The croft, latterly known as Greenhill, was the last croft to the south of the road north out of Brora just before it crossed the Clyne Milton Burn. The croft consisting of a dwelling house built of stone and lime and a byre and barn of stone and clay, all thatched with straw built around 1820 built when John MacDonald first took over the "lot". I would suspect he had been moved from better inland grounds as part of the Sutherland estates improvements. There recently were some major clearances around the 1820's In 1849 eight years after this census an estate "audit" stated that the buildings were - "at present in good condition" but that Isabella now the tenant "does not possess all the land that her father had - she has only a small bit of it". When, where and how much land had been lost and where and how much was left is unknown. For the census of 1851 Isabella and family were still living at Lower Achrimsdale, though now this collection of crofts was named as Greenhill. Isabella is now recorded as a "lotter" - the person who rents a portion or lot of land. Her youngest son is still listed as a scholar and her elder son Alexander at least seems to have been give a trade by his father - "saddler". 1851 Census (31st March) Clyne (45) Book 2. Page 16. Isabella and family were still at Greenhill for the census of 1861. Isabella's age has been wrongly recorded as 72 - it should be 62. Younger son Donald seems to have followed in big half-brother's footsteps and also become a "saddler". It is also noticeable that Alexander is following in the family tradition of the "one parent family" - unmarried but living with his son George Alexander Cameron, his son by a Jessie MacDonald, born on 5th October 1856. 1861 Census (8th April) Clyne (45) Book 2. Page 10. In May of 1869 Isabella had a visit from her brother, Robert, and her grand nephew, Alexander McLennan, as in a letter from from Robert to his son Roderick dated 31 August 1869 he wrote - "A. McLennan was here lately seeing us about the time that we received your letter of the 2nd of June & I gave him the reading of it. He & I went over to Sutherland for 3 days to see our friends there, & we enjoyed it well. We went by train to Golspie, & back again by the same." This self same railway was literally cutting through Isabella's back yard, trapping them between road and railway and cutting of the view to the sea. The following year her nephew Alexander was staying with her whilst recuperating from what sounds like malaria?. Ahain this is mentioned in a letter from from Robert to his son Roderick dated 9 June 1870 where he wrote - "Alex'r is over in Sutherland with my sister & hers. After coming home from Jamaica he was frequently attacked with the Ague, & went to Sutherland in hopes of getting better, & they kept him for a while, & he built a boat for them, & is a little better, & the fits are less frequent, nor continuing so long as formerly." For the 1871 census we find Isabella and her son, Alex Cameron still at Greenhill. Although Isabella is the "tenant" of the croft, Alexander is the HEAD. 1871 Census (3rd April) Clyne (45) Book 2. Page 12. Her younger son Donald Sutherland is no longer at the family home having married Margaret McKay on 13th March 1863. Margaret was the daughter of Donald MacKay and Anne Gunn who were married on 18 November 1831 in Clyne. There are two children recorded to Donald and Anne in the IGI - George born 1 April 1834 in Clyne and "our" Margaret born on 3 February 1837 also in Clyne. A few months after this sad time Isabella MacDonald died on 28th July 1874, aged 77, at Greenhill, the parish of Clyne, Sutherland. Just to confirm that this Isabella MacDonald is one and the same as our Isabella, Robert MacDonald states in a letter of 20th October 1874 to his son Roderick - "my sister died on 28th July last" i.e. 28th July 1874, and the death certificate of the aforementioned Isabella MacDonald records her parents as John MacDonald - Loth, and Katherine MacDonald, ms. MacDonald, both deceased, with the informant "Alex Cameron - son"! Born May 1801 or 1802 in Lothbeg. Alexander married Christian MacIntosh on 20th November 1830 in Golspie, Sutherland. in !826 a few years before his marriage there is a record of a "Mr Alexr Macdonald, Merchant, Golspie, Unmarried" which I would assume is "our" Alexander. It would seem likely that Alexander MacDonald and Christian MacIntosh emigrated to North America sometime in 1831 as we know they were in Golspie, Scotland for their marriage on 20th November 1830, but by the birth of their first daughter Georgina on 19th June 1832, they were in Roger Hills, Pictou, Nova Scotia. In a letter of Robert MacDonald's to his son Roderick he states that Alexander "was first a merchant, & after losing all his effects by fire in America, became a schoolmaster in Nova Scotia. 1831 - the brig "Corsair" from Cromarty, which took 49 days carrying 161 passengers. 1831 - the brig "Rover" from Cromarty, carrying 116 passengers. 1831 - the brig "Lord Brougham" from Inverness, carrying emigrants. 1831 - the barque "Industry" from Inverness, which took 43 days carrying emigrants. 1832 - the brig "Sylvanus" from Cromarty, which took 52 days carrying 196 passengers. 1832 - the brig "Blagdon" from Cromarty. 1832 - the brig "Canada" from Inverness carrying 103 passengers. However Alexander MacDonald and Christian MacIntosh arrived in Canada, as previously stated they were in Roger Hills, Pictou, Nova Scotia at approximately 10 o'clock p.m. on the 19th June 1832 for the birth of their first daughter Georgina. Georgina was baptised by the Rev. Kenneth MacKenzie of Pictou on 18th July 1832. 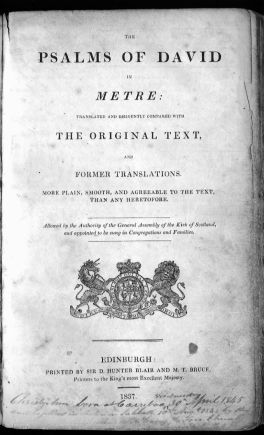 Alexander MacDonald and Christian MacIntosh had seven children in all, and their births, (along with his and his wife's) were recorded on the fly leaf of Alexander's New Testament Bible sent over from the homeland by the Duke and Earl of Sutherland, George Granville Sutherland Leveson Gower to "His Clansmen in America". Alex. 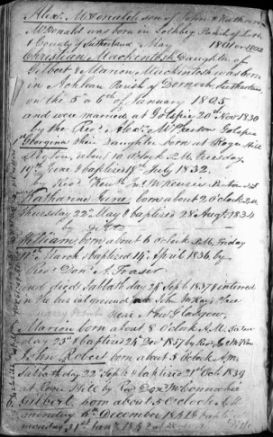 MacDonald son of John and Katharine MacDonald was born in Lothbeg, Parish of Loth, County of Sutherland, May 1801 or 1802. 1st Georgina their Daughter born at Roger Hill, Pictou, about 10 o'clock p.m. Tuesday 19th June & baptized 18th July 1832 by Rev. Kenneth McKenzie, Pictou, N.S. 3 William born about 6 o'clock p.m. Friday 11th March and baptized 14th April 1836 by Rev. Don A. Fraser and died Sabbath day 24th Sept. 1837 & interred in the burial ground near John McKay's place ?Quarry Point? near New Glasgow. **against this is a note age 1yr 6m 12d 13 hs = age at death (means William died about 7 o'clock a.m. on 24th Sept. 1837) and ?1yr 9m 12d? = gap to Marion. 4 Marion born about 8 o'clock a.m. Saturday 23rd & baptized 24th Dec 1837 by Rev. ?Jno McRae? . 5 John Robert born about 5 o'clock a.m. Sabbath day 22nd Sept. & baptized 21st Oct 1839 at Roger Hill by Rev. Don. McConnochie. The notes of gaps between children show Alexander to have been an educated man, and possibly a bit of a perfectionist - William's age at death down to hours!! However the detail for his wife, Christian's birth is not quite accurate being out by two years. Christian Macintosh was actually born on 5th January 1803 in Dornoch, Sutherland, the daughter of Gilbert MacIntosh and Marion MacLeod. She had four brothers, William, born 4th February 1794, George born 18th May 1798, William born 7th April 1805, Hector born 17th August 1813 and three sisters Catherine born 10th April 1796, Margaret born 26th September 1800, Anne born 18th February 1810, all also born in Dornoch, Sutherland. We have a wealth of Information about Gilbert MacDonald and his descendents, though little about any of his siblings. This is due to the fact that we are in contact with Irma MacDonald, his great-granddaughter, who lives in retirement with her husband Jack Isnor, near the old family grounds in Pictou. 2 M i. John Alexander MacDonald was born 31 May 1869 in Earltown, Colchester. He died 1950 in W. River st'on, Pictou. + 3 F ii. Rose Annie MacDonald was born 23 Jul 1871 and died 16 Dec 1899. + 4 F iii. Olivia Jane MacDonald was born 27 Oct 1874 and died 24 Jan 1956. + 5 M iv. Donald William MacDonald was born 23 Nov 1881 and died 14 Sep 1952. 6 F v. Christine Annie MacDonald was born 20 Nov 1885 in Earltown, Colchester. She died 19 Apr 1905 in Earltown, Colchester. + 7 M i. Herbert Dawson McDonald was born 20 Dec 1894 and died 6 Mar 1978. 8 F ii. Annie Isabel Clyde McRae was born 26 Apr 1897 in St Croix, Windsor, Ns. She died 16 Nov 1899 in Truro, Colchester, Ns. + 9 M i. Daniel Colin McDonald was born 19 Feb 1905 and died 24 Mar 1977. 10 M ii. Gilbert Luther McDonald was born 13 Mar 1906 in Watervale, Pictou. He died 18 Jul 1971 in New Glasgow, Ns. 11 F iii. Christene Ellen McDonald was born 16 Dec 1909 in Watervale, Pictou. She died 3 Mar 1965 in Pictou, Ns. + 12 F iv. Anna Isabel McDonald was born 10 May 1912. 13 M v. John Alexander McDonald was born 1 Nov 1914 in Watervale, Pictou. He died 30 Sep 1986 in Halifax, Ns. 14 M vi. Martin Fraser McDonald was born 3 Feb 1917 in Watervale, Pictou. He died 28 Jul 1992 in Pictou, Ns. + 15 F i. Ella Christine MacDonald was born 1917 and died Sep 1979. + 16 M ii. James G MacDonald was born 1920. + 17 M iii. Alexander M MacDonald was born 1932. + 18 F iv. Nancy Elizabeth Catherine McDonald was born 14 May 1934 and died 27 Nov 1993. 19 F i. Isabel Annie McDonald was born 21 Aug 1927 in Riversdale, Colchester.Isabel married John Hingley on 23 Jul 1955. + 20 F ii. Lillian Christine McDonald was born 2 Mar 1930 and died 13 Nov 1993. + 21 M iii. Gilbert Russell McDonald was born 25 Aug 1932. + 22 F iv. Florence Louise McDonald was born 13 Jan 1936. + 23 F v. Elizabeth Ellen McDonald was born 30 Sep 1939. 24 F vi. Phyllis Diane MacDonald was born 23 Oct 1946 in Riversdale, Colchester. Phyllis married Terance Jaques. + 25 F i. Janet Ellen McDonald was born 8 Feb 1928. + 26 F ii. Irma McDonald was born 15 Sep 1933. 27 M i. William Charles McDonald was born 29 Mar 1942 in New Glasgow, Ns. + 28 F ii. Marie Isabel McDonald was born 12 Oct 1944. 29 F iii. Patrica Jane McDonald was born 27 Mar 1947 in New Glasgow, Ns. She died 2 Apr 1955 in Halifax, Ns. + 30 M iv. Daniel Roderick McDonald was born 7 Feb 1949. + 31 F v. Jessie Anna McDonald was born 19 Oct 1953. + 32 F i. Betty Hamilton. 33 M ii. Murray Hamilton was born in Oshawa, Ontario. 34 M iii. David Hamilton. + 35 F i. Betty Jane MacDonald was born 6 May 1947. 36 F ii. Sara Susan MacDonald was born 24 Feb 1952 in Toronto, Ontario. Sara married Stanley Patter. 37 M i. James Donald MacDonald was born 18 Sep 1957. 38 M ii. Thomas Andrew MacDonald was born 17 Sep 1960. 39 M iii. Peter Michael MacDonald was born 23 Sep 1965. 40 F iv. Chantal McDonald was born 1950. 41 M v. Sylvian McDonald was born 1958. 42 M vi. Gilles McDonald was born 1959. 43 F vii. Susy McDonald was born 1963. + 44 M i. Robert Donald Zinck was born 13 Jan 1962.